Lismore-based teenager Nathan Herne claimed his first sedan race win by winning the final race at Round 2 of the 2019 TA2 Muscle Car Series at Morgan Park Raceway. The reigning Victorian and New South Wales Formula Ford champion rounded up Aaron Seton around the outside of Turn 1 off the start and was never headed, despite Seton staying on his rear bumper for the entire 12-lap battle. Seton won Sunday’s earlier race, while George Miedecke slowed in the final three laps with a puncture allowing Herne and Jarvis through to second, as Andrew Miedecke’s Dodge and Russell Wright’s Mustang rounded out the top five. Wright survived a 360 spin under the bridge after being pushed wide while Mark Crutcher, Shaun Richardson and Drew Ridge enjoyed a race long battle, Ridge charged through to ninth after starting from the rear of the grid. Dream Racing Australia’s Craug Scutella took out Shaun Richardson at Turn 1 late in the race with both tagging the wall, while Matt Mackelden spun the Kubota Racing Mustang after being tagged by Michael Kulig’s Camaro. The final 12-lapper was marred by a crash at Turn 2 off the start involving Anthony Tenkate, who hit the inside tyre wall hard when he spun off the track. Tenkate was caught up in a first corner carve-up that included Cameron Sendall and Shaun Richardson. The race was red-flagged while the medical team attended to Tenkate who was badly winded. On the restart, Herne made his move and despite a four-way freight train behind him involving Seton, Miedecke, Jarvis and Andrew Miedecke, the 16 year old showed great maturity and race craft to hang on for the win. “This is one of the biggest wins of my life,” said Herne. “I knew I had to make the move early, and it was a full heart-in-the-mouth moment going around the outside of Aaron through Turn 1, but I made it stick and was able to put my head down and have a crack. George Miedecke passed Jarvis for third into Turn 6 with two laps remaining, while Wright parked his Mustang on the in-field with a throttle cable issue mid-race. Herne won by three tenths of a second from Seton, Miedecke, Jarvis, Andrew Miedecke, while Kulig, MacKelden, McAlister, Robinson and Murray Kent rounded out the top ten. Kulig picked up the Wildwood Big Braker Award for his best TA2 result yet, and Drew Ridge took home the Circo Hard Charger Award for his climb from last on the grid to ninth in Race 3. Seton still came away with the round win and continues to lead the Performax Cup on 432 points, from George Miedecke, Ashley Jarvis, Andrew Miedecke, Hugh McAlister and Murray Kent. 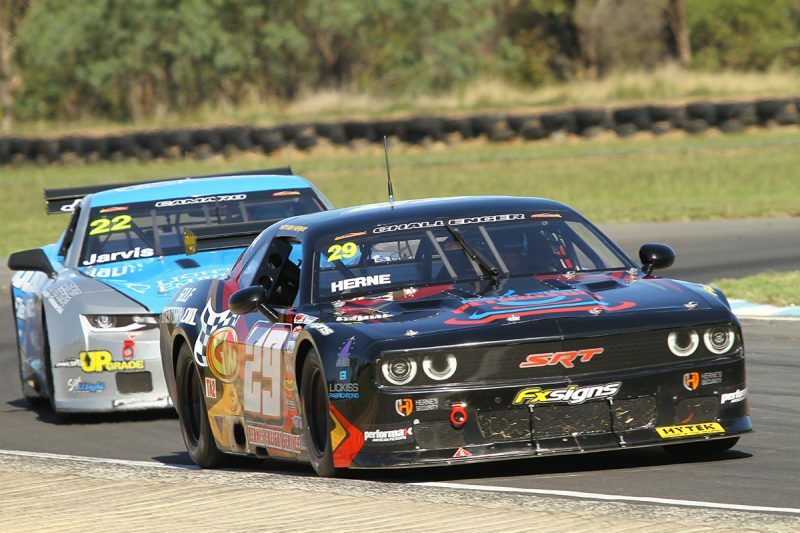 Round 3 of the 2019 TA2 Muscle Car Series heads to the series’ maiden visit to South Australia and The Bend Motorsport Park on June 22/23. Highlights from Round 2 at Morgan Park will be replayed on Foxtel channel Aurora on April 15, check your local guides.